Please click through to my Flickr to see these pictures full size. 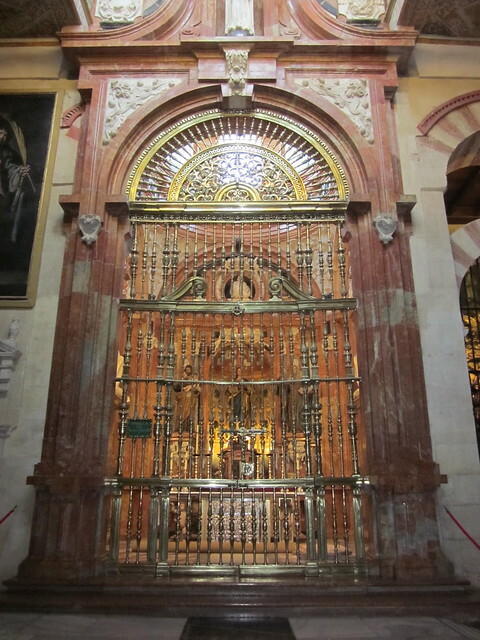 After walking through the Puerta del Perdón, you enter the courtyard. The courtyard is full of orange trees. 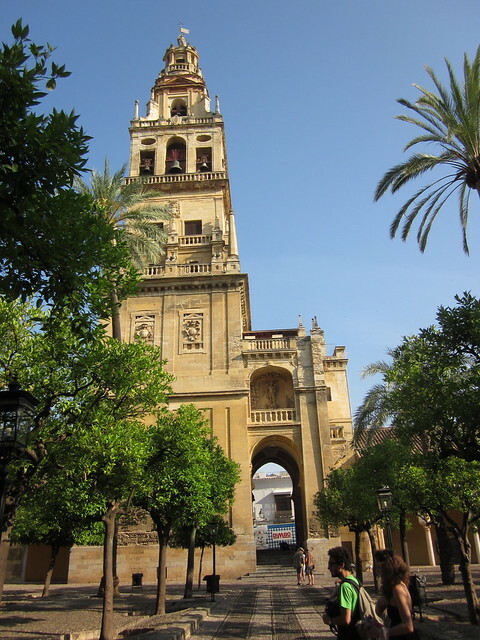 Beside the Puerta is the Torre del Alminar. This bell tower was build in 12th century over the mosque's minaret. This is one of the windows that look out onto the courtyard. 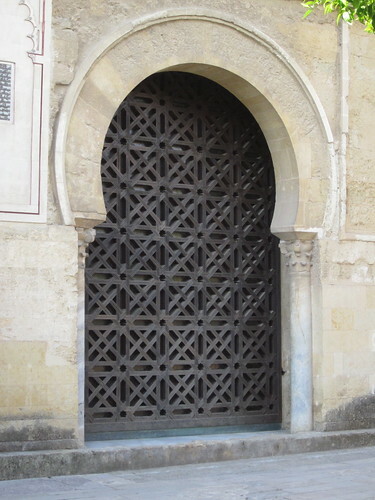 It has the typical horseshoe arch and Muslim screen. 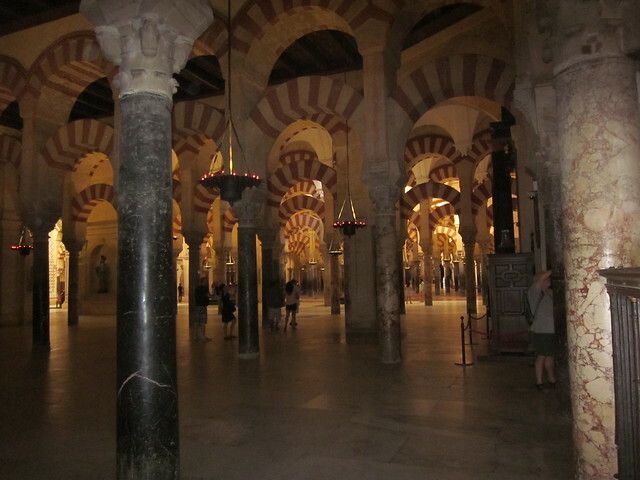 Inside you can see the red and white arches of the mosque prayer hall. 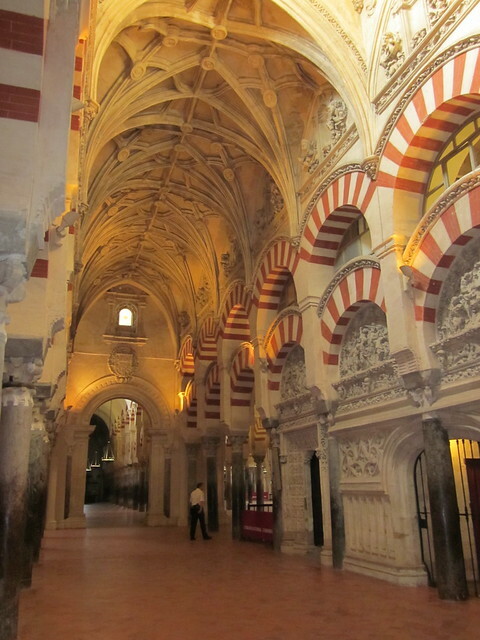 These arches are supported by 856 columns that were salvaged from Roman and Visigoth ruins. 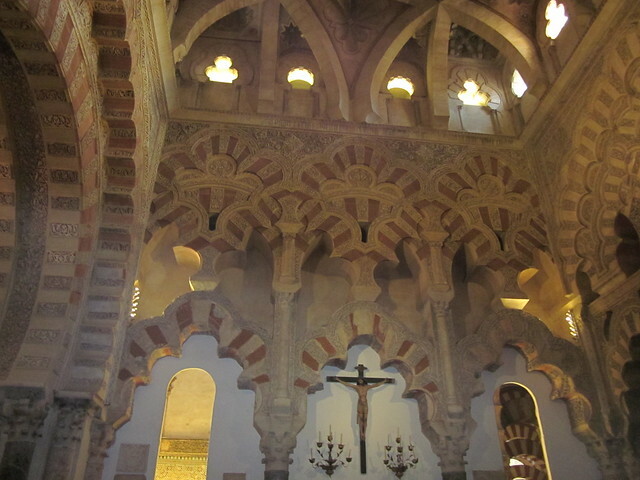 The mosque was built on top of the 5th century Church of St. Vincent. Both Wikipedia and Lonely Planet claim that this church was Visigoth, but the sign at the cathedral says it was a Roman basilica. You can see a section of this church through a hole in the floor. 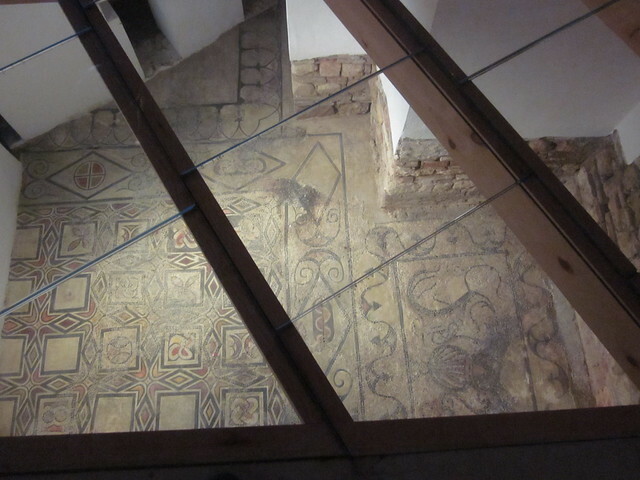 It looks like Roman tile work to me. 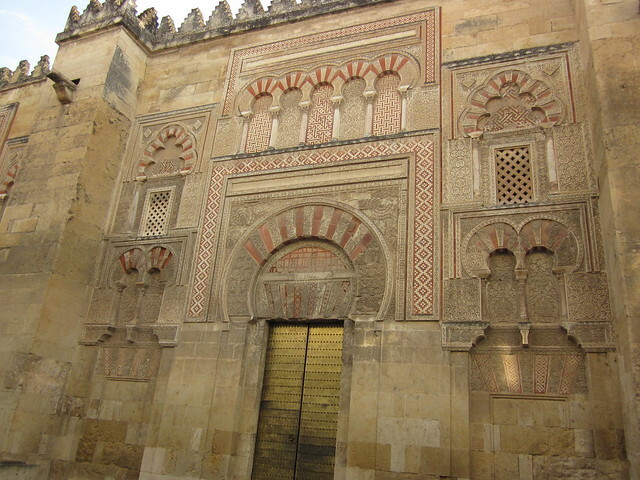 The mihrab or prayer niche was the focal point of the mosque. It faces toward Mecca. 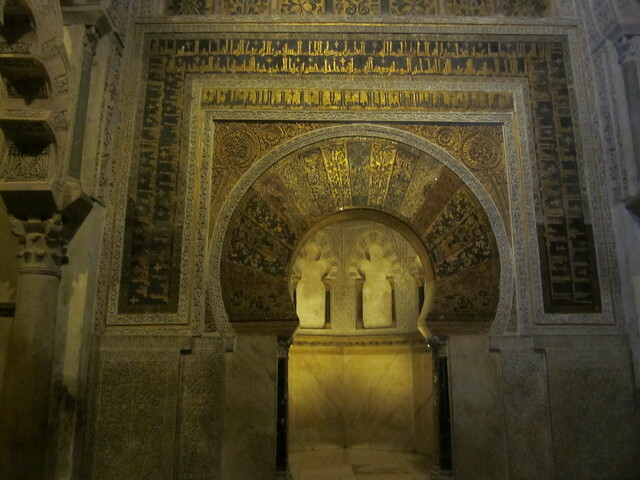 It is decorated with gold cubes that were given to the Moorish by the emperor of Byzantium. 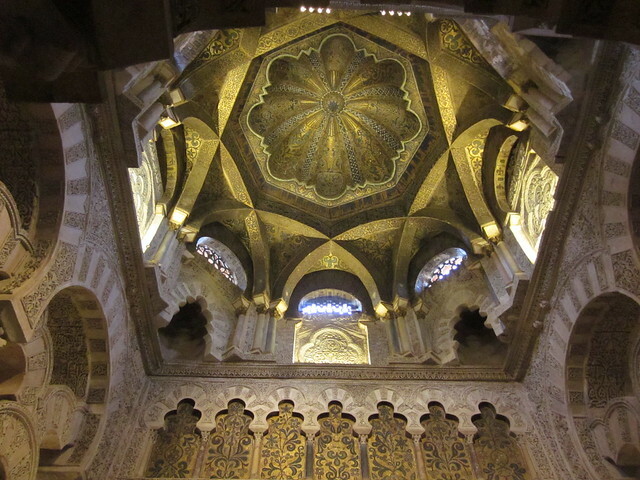 The ceiling of the mihrab. The ceiling of the maksura or royal prayer enclosure. They had it walled off, so I couldn't get a better picture. 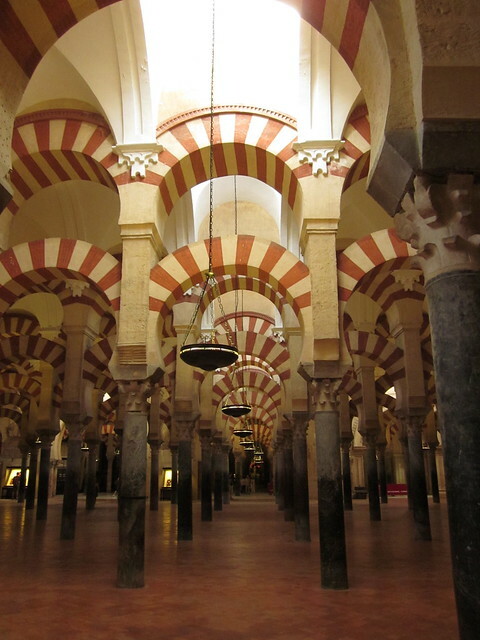 The Christians made several changes to the mosque over the centuries as they adapted in into a cathedral. Gothic arches were added among the horseshoe arches. 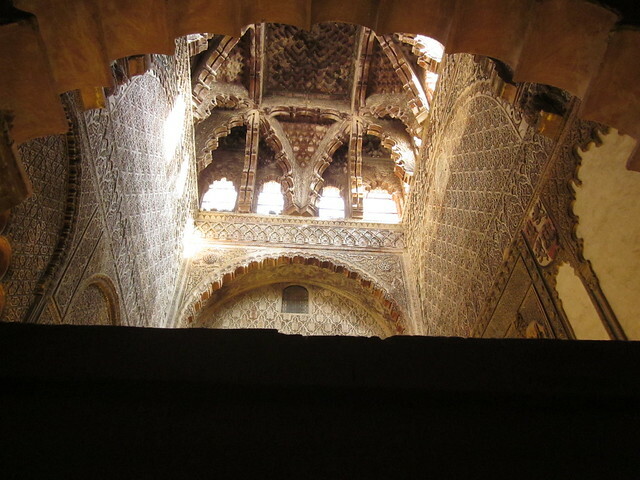 The Capilla de Villaviciosa was added in 1277 among other Moorish arches. 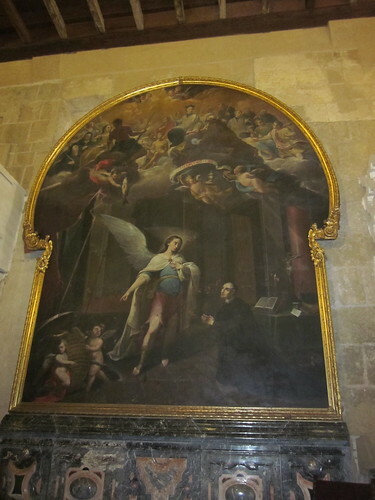 It served as the Capilla Mayor or Main Chapel until the 1520s. 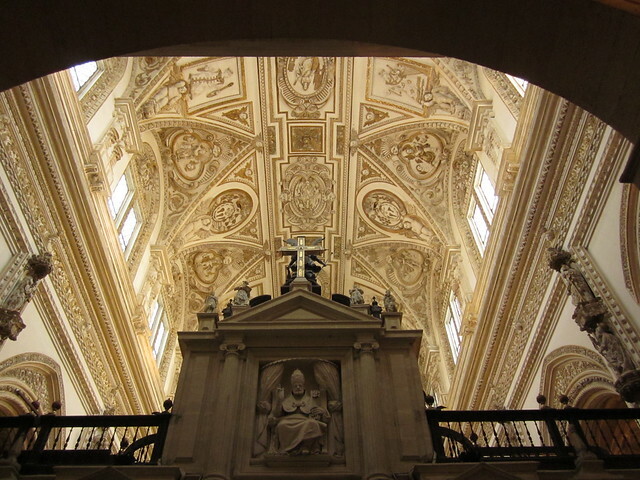 This is the ceiling of the choir which was added in the 1750s. 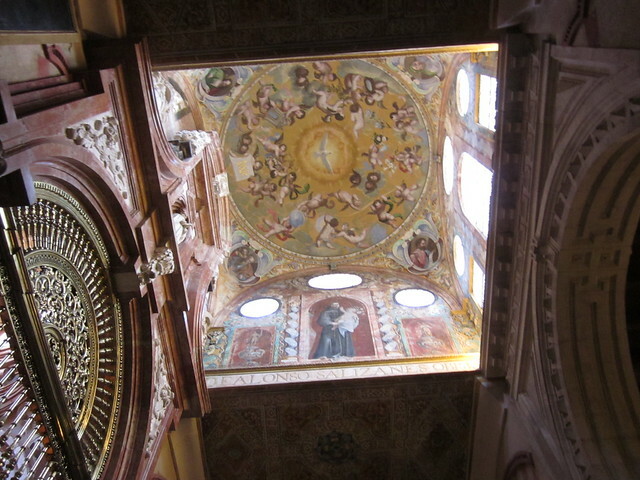 Pictures from some of the other chapels. 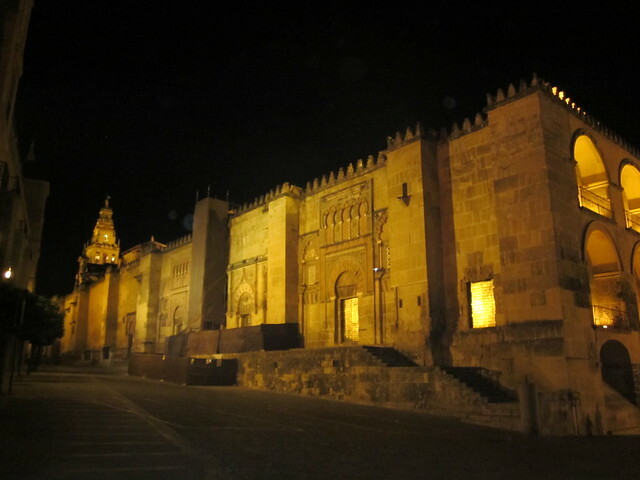 Exterior of the mosque-cathedral at night. 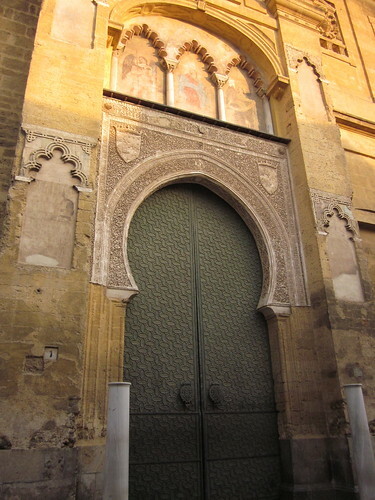 The Puerta de San Juan is one of the exterior doors. It was restored in 1913. And finally, if you have made it this far, a video of the bells in the tower ringing. Today Muslims are not allowed to pray inside the cathedral. They have petitioned the Vatican for permission and been denied. Information in this post was mostly taken from Wikipedia and Lonely Planet Spain. You should go. The photos don't really capture the atmosphere. From 8:30-9:30 am, admission is free and tour groups are not allowed during that time so it's quieter. What a gorgeous building. It's a bit of a hodge-podge, but a brilliant hodge-podge. What a special place,really interesting to read about and watch the pictures. Thanks for posting! You're welcome. Glad you enjoyed the post. That's an amazing place and well worth a visit, thanks very much for sharing! Glad you enjoyed it. You're welcome.